Preheat oven to 350 degrees. Butter or oil and 8-inch baking dish; set aside. Bring a large pot of water to a boil over high heat. Cook penne, according to package direction, for 2 minutes less than recommended on the package. Rinse pasta in cold water; set aside. In a medium bowl, mix together cooked pasta and sauce gently but thoroughly. 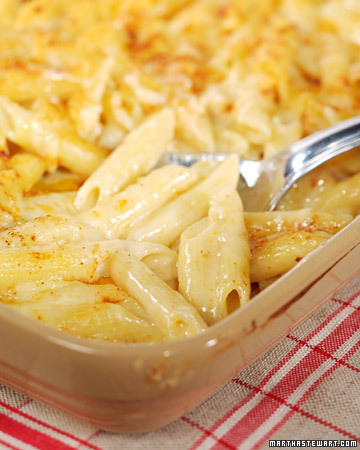 Pour pasta into prepared baking dish; sprinkle with cheeses and chile powder. Bake, uncovered, for 20 minutes. Let stand 5 minutes before serving.